Workout Wednesday is here and I’ve got TWO workouts to share. Les Mills workouts have the best stretching EVER. It always feels like dessert. My legs really started getting tired at about the middle point of Combat. Between yesterday’s workout and all the jumping around with TurboFire, I was definitely starting to feel it towards the end. After uploading today’s Workout Wednesday video, I now have 32 videos on YouTube!! I never thought I’d be saying that. If you are unable to view the video, please click here to watch it on YouTube. Did you see that huge punch at the end?? LOVE. 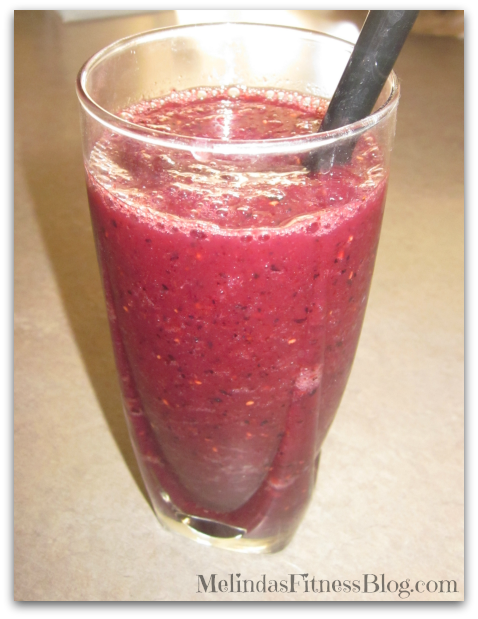 After I was done I made a pretty fruit smoothie made with frozen berries, water and a smidge of honey. It was delish! It’s amazing how smoothies can still taste pretty good without milk or yogurt. They aren’t as creamy but still very tasty! I’ll update a bit more on my Paleo experience tomorrow. Please comment below if you worked out today! Mmmmmm! That looks so refreshing. I love strawberry smoothies like this when its super hot out!